← “Corban Nation” receives a stirring review from Jazzsensibilities on March 21, 2017. 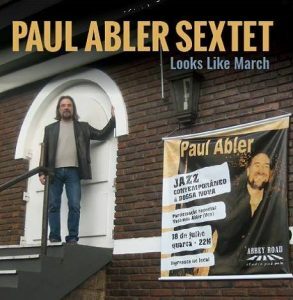 Paul’s most recent CD, Looks Like March, is a beautiful, melodic work with seven original compositions played by the Paul Abler Sextet: Paul on guitar, James Weidman on piano, Mark Sherman on vibraphone, John Fedchock on trombone, Harvie S on bass and Paul’s closest friend Leonard King on drums. The CD will be posthumously released June 2nd from 8PM – 11PM at Trumpet’s Jazz Club in Montclair NJ. With an All Star Band! This entry was posted in Artist Interview Series, Guitar Code, LIve Music, Records, Reviews, Uncategorized and tagged #abrushfire, #contemporaryfusion, #corbannation, #corbannationcd, #fusionguitar, #harvies, #harviesbass, #instrumentalguitar, #jamesweidman, #jazz guitar, #jazzfusionguitar, #jazzguitar, #karionproductions, #larrycorban, #larrycorbanguitar, #larryjazz, #Live Jazz, #Live Music, #livejazz, #livemusic, #mainstreamjazz, #newyorkcityjazz, #NYC jazz guitar, #nycfrighteningguitar, #nycguitar, #nycjazzfusionguitar, #nycjazzguitar, #NYjazz guitar, #paulabler, #shredjazzguitar, #stevewilliams, #yashmincharnet-abler, bossanovamusicproductions. Bookmark the permalink.